The Jalopnik community has been doing an excellent job of highlighting some the vehicles and experiences of drivers with disabilities. This increased awareness always brings to the forefront an issue that bothers us all, disabled or not...handicapped parking. Far too often folks with legitimate impairments can't utilize the spots made for them because those spaces are occupied by drivers who don't belong. Law enforcement usually does not have the time and resources to enforce handicapped parking as much as we would like, but there may be a solution….licence plate scanners. Handicapped parking offenders primarily fall into two categories. First, asshats with no tags or placards of any kind who are either too lazy, too stupid, or too entitled to walk an extra couple of feet. These folks should have their cars towed and volunteered for the local demolition derby. I know I would pay good money to see that. The second group of offenders is a bit trickier. These are people with handicapped plates or placards but are themselves not disabled. I call these the "grandma died so I get great parking" bunch. Keep in mind it is also very difficult to discern who is legitimately disabled or not, so I ask all of you please don't jump to judgement of someone in a handicapped space with the proper tags even if they "look like they can walk fine." Recently my wife, a disabled driver, had to re-certify her tags and placards, because the NJ DMV is issuing a new program that all disabled plates/tags must be reevaluated after 3 years. She had to get proper documentation from her doctor that stated explicitly her disability in addition to updating some paperwork. While this caused a minor inconvenience of going to the local DMV for an hour we were glad that something is being done to ensure that the right individuals are getting disabled parking permits. Of course extra paperwork and new tags aren't going to stop the problem if there is no enforcement. I realize that most police officers have better things to do than write citations for handicapped parking violations. But if we can make the enforcement quicker and more convenient this would result in a win-win situation by cracking down on illegal parking and increasing the local revenue through tickets. Currently across many municipalities law enforcement are using licence plate readers to scan vehicles as the officer patrols. These readers access a database of outstanding tickets, warrants, and other offenses. If a plate comes back positive, the officer can then take whatever action they deem necessary. Of course this practice is controversial, and I am not here to debate the methodology. However, since the new disabled tags/placards now have updated database information about the driver/passenger with a disability as well as an expiration date, this could be an opportunity to use the licence plate readers. Law enforcement could cruise around a mall or shopping center scanning the disabled plates. If a plate comes up out of date or registered to the wrong car (hanging placards are different, they can be used on any vehicle) the officer can then issue a citation or even better just have the system mail it to the vehicle's residence. Though having the officer physically stand there and write the ticket would send a powerful message to others. Perhaps this level of enforcement could be taken a step further like Sonoma officers did at this NASCAR race. 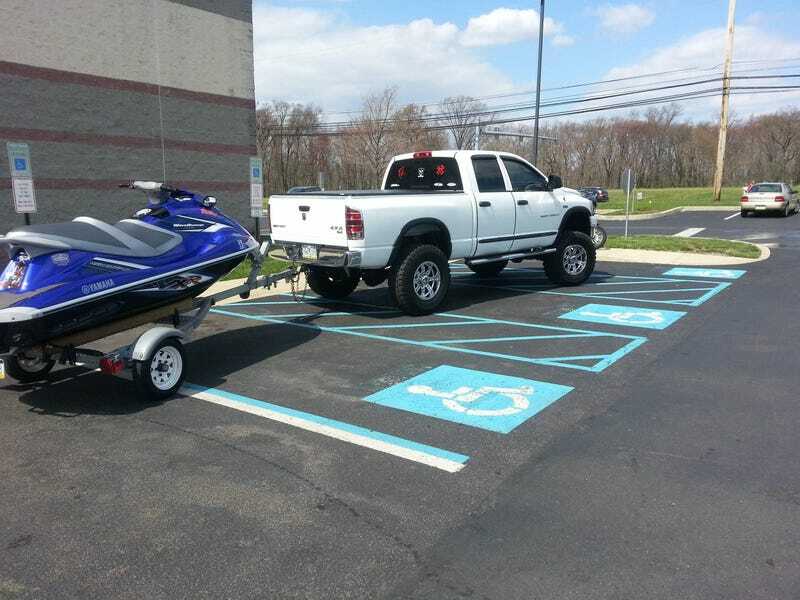 What do you think can be done, within reason, to keep the asshats out of handicapped spots?